On a recent visit to the House of Commons at the beginning of October, my attention was focused on the banter of question period until a well-dressed man in a bright red turban walked into the chamber and took a seat. In the visitor’s gallery. Jagmeet Singh, who had won the NDP leadership with a decisive 53 per cent of the vote just two days earlier, looked down on his MPs as they pressed the government on the issues of the day. He could only watch quietly. Although it is not unheard of for a major federal party to elect a leader who does not hold a seat in Parliament – the ranks of which include three former NDP leaders: Tommy Douglas, Alexa McDonough, and Jack Layton – it is more uncommon for one to show little interest in campaigning for one. During his leadership campaign, Singh said he was comfortable not running for a seat until the 2019 election, saying he wanted to travel the country on a sort of outreach tour first. Then, following his momentous victory, Singh hinted that he might be open to campaigning for a seat before the election, but only if he finds a riding that he holds an “authentic connection” to. I suggest he find that authentic connection sooner rather than later. At Queen’s Park, the Ontario provincial legislature where Singh worked as deputy leader of the provincial NDP, the politician and lawyer proved himself a formidable member of the opposition and orator. Singh has effective questioning skills and a knack for parliamentary debate. Canadians need to see that in the House of Commons. Singh needs to fill the gap former leader Thomas Mulcair left behind after being voted out as party leader following a decisive defeat of the NDP in the 2015 federal election. As leader of the official opposition during the Harper years, Mulcair grilled the prime minister trenchantly during question period. The most memorable example of such questioning unfolded during the Mike Duffy Senate scandal in 2015, when Mulcair lifted the NDP to its highest level of public approval. Going into the 2015 federal election campaign, the NDP were favoured to unseat the ruling Conservatives, or at least increase its share of seats in Parliament. That dream fell to pieces for Mulcair and the NDP on election night, when the party lost 59 seats, primarily in Quebec, and saw itself demoted back to third party status. 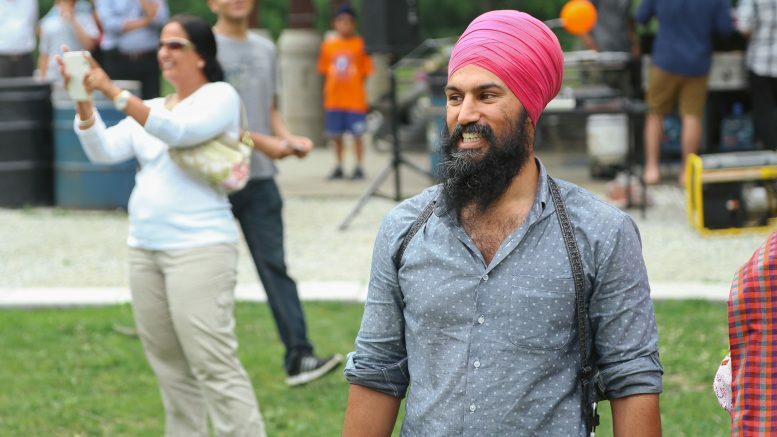 To most NDP supporters and political observers it is clear: Singh needs to win back Quebec. A national outreach tour will not be enough for that. As leader of the NDP, Singh needs to prove he has the interests of progressive voters in Quebec at heart more so than the prime minister, who is himself a Quebecer. As soon as he can, Singh should be standing across the aisle from the government benches on Parliament Hill, grilling the prime minister on issues left-leaning Canadians – and especially Quebecers – care about. As a conciliatory measure, Singh did appoint Guy Caron – former leadership opponent and proud Quebecer – as the party’s parliamentary leader while he crisscrosses the nation. This move may keep Quebec’s NDP members satisfied in the short term, but it will not garner the party any new support in that province, or across Canada for that matter. That job is for the leader. And if Singh wants to go to Quebec to hear the concerns of the people and bolster his brand with francophone Canadians, then he need not worry. Ottawa is right across the river from Quebec, so he won’t be far. If the new NDP leader wants to be seen as a viable left-wing alternative to Justin Trudeau by 2019, then he has to take the prime minister head-on. And Singh can only do that from the opposition benches of parliament.